Is Quest Diagnostics Inc (NYSE:DGX) ready to rally soon? Hedge funds are in a bearish mood. 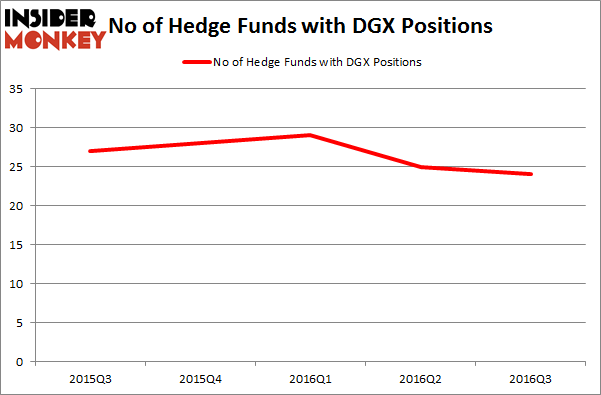 The number of long hedge fund bets went down by 1 lately. The level and the change in hedge fund popularity aren’t the only variables you need to analyze to decipher hedge funds’ perspectives. A stock may witness a boost in popularity but it may still be less popular than similarly priced stocks. That’s why at the end of this article we will examine companies such as Cenovus Energy Inc (USA) (NYSE:CVE), Oneok Partners LP (NYSE:OKS), and ArcelorMittal (ADR) (NYSE:MT) to gather more data points. At the end of the third quarter, a total of 24 of the hedge funds tracked by Insider Monkey held long positions in this stock, a decline of 4% from the second quarter of 2016 and the second quarterly drop in hedge fund ownership in a row. With hedge funds’ sentiment swirling, there exists a few notable hedge fund managers who were boosting their stakes significantly (or already accumulated large positions). According to Insider Monkey’s hedge fund database, Cliff Asness’ AQR Capital Management has the biggest position in Quest Diagnostics Inc (NYSE:DGX), worth close to $107.9 million. The second most bullish fund manager is Marshall Wace LLP, managed by Paul Marshall and Ian Wace, which holds a $78.1 million position. Remaining peers with similar optimism include John W. Rogers’ Ariel Investments, Joel Greenblatt’s Gotham Asset Management and Bernard Horn’s Polaris Capital Management.